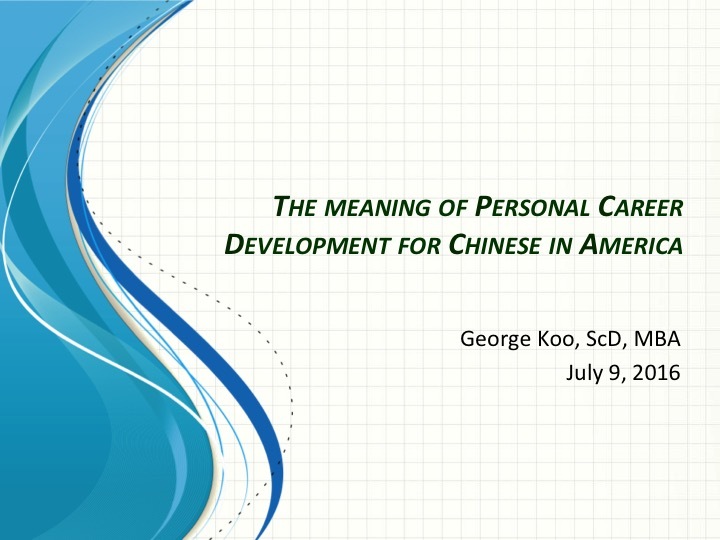 Below is the text of my speech given on July 9, 2016 at a career development conference sponsored by Chinese American Semiconductor Professionals Association held in Santa Clara. Good afternoon everybody. I stopped going to work on a regular basis since 2008 (my ex-colleagues might even say it was earlier than 2008) and I got off the board of a large cap, NYSE listed public company in 2014. Other than writing occasional op-ed pieces for online Asia Times, I am enjoying my retirement. We live in America, a society where old soldiers are quickly forgotten. So this is an unexpected surprise and pleasure to be invited to speak before you today. Fortunately for me, we Chinese respect our elders and presume that they have grown wiser from the accumulation of life experiences and thus they are not to be quickly put into the dumpster. Also fortunate for me, I know Simon Ma and he invited me. So, thank you Simon. I have lived in Silicon Valley practically before there was a Silicon Valley, since 1971, and I am delighted today to share with you some of my lessons learned. 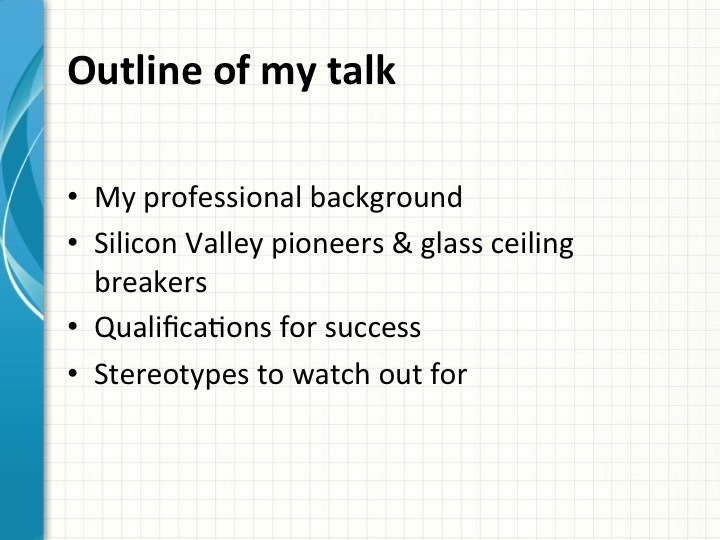 My talk today is roughly divided in four parts. First as brief as possible I need talk a little about my career to put what I have to say in proper context. I certainly am not about suggest that what I have to say is the only path to enlightenment but I hope you could better understand my remarks in light of the life I’ve had. 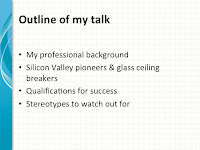 Next, taking advantage of the vantage point of a senior citizen, I am going to tell you some stories of some of the Chinese America pioneers that broke the glass ceiling and pave the way for succeeding generations such as you folks in the audience to succeed. I am honored and pleased to say that these individuals are contemporaries and friends of mine. Of course, there is a price to be paid for success, whatever that might mean to each one of you individually. Since the theme of this conference is how to succeed, I can presume that you are all interested what that means. 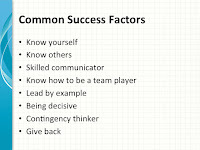 So I plan to summarize for you what I think are the essential characteristics for success in your professional career. Lastly, if you don’t already know and feel it already, America is not a level playing field for us Chinese. To have a successful career and not just a so-so career, you need to be sensitive and aware of how the field is tilted against you. As I have been writing my autobiography for my grandchildren, I reflect that I have been lucky and enjoyed the best of two worlds. First, I finished 6th grade in China and thus has a solid foundation in Chinese, which I was able to maintain by avidly reading 三国演义 (Romance of Three Kingdoms) and later on when I was in college, an endless supply of武侠小说 (martial arts novels). Second, I was fortunate to get a scholarship and attend MIT and got a quality education. Third, I met May Jen who became my wife without her love and support, I wouldn’t have a story to tell today. I won’t bore you with the details of my life or professional career, but just to let you know that I started in a major American company, a predecessor of today’s Honeywell. I was considered a rising star. The company did not have an organized education assistance program in those days but the corporate vice president in charge of R&D took me out to lunch one day and offered me leave with pay so that I can complete my doctorate degree while keeping my position at the company. My Chinese language background, my technical background and my consulting experience enable me to jump off the normal career path to become an advisor to Corporate America on doing Chinese in China. Thus I had the privilege of a front row seat as I witnessed the rise of China. My China experience directly led to an invitation to serve of on the board of the world’s largest integrated resort/casino company in the world. Throughout my working career I developed the knack to write clearly and succinctly. In putonghua, we would call it 一针见血 style. In my retirement, I use my skill to become a regular contributor to online Asia Times where I strive to present a point of view representing Chinese in America and not the general mainstream public. 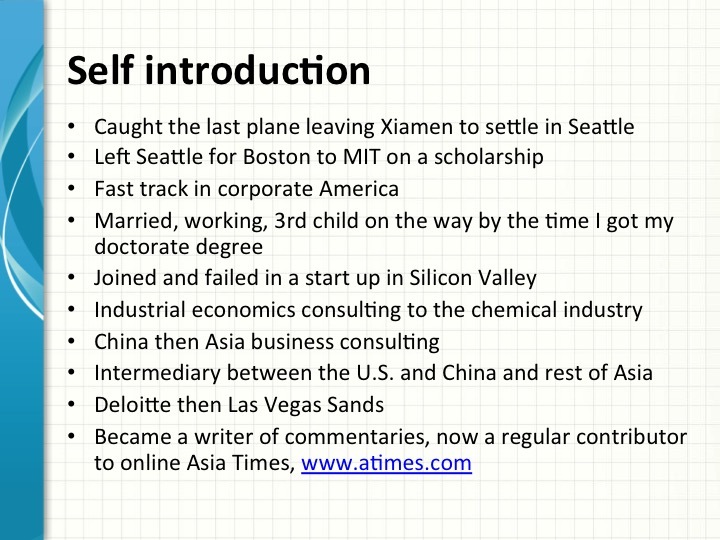 As I said at the beginning of my talk, this—hopefully you would consider it as brief—self-introduction is to give context to the rest of my presentation. When my family arrived as refugees from China in 1949, ethnic Chinese residing in America make up around one tenth of one percent of this country’s population. 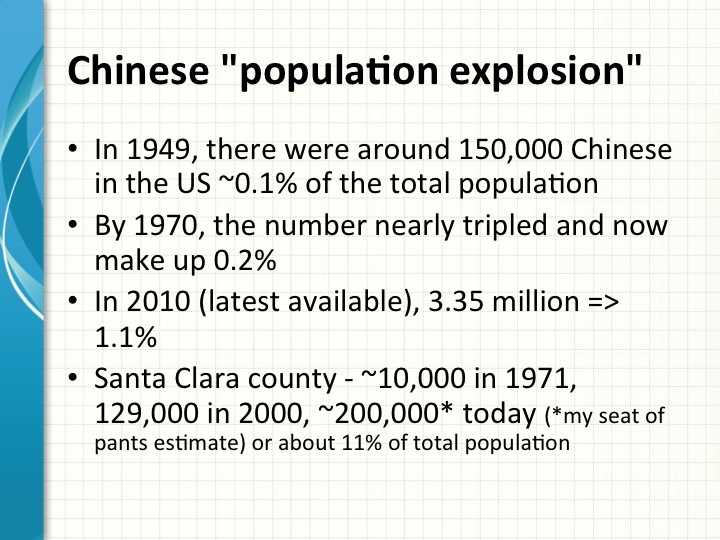 By the time my wife and I immigrated to Silicon Valley from New Jersey, the Chinese population in America has just about tripled, but still a relatively insignificant number. There was no such place known as Silicon Valley, just fruit orchards in Santa Clara. To buy Chinese groceries and have a dim sum lunch, we would need to drive into Chinatown in San Francisco. Today we are around 4 million around the country. I can get groceries at Ranch 99 and dim sum lunch in downtown Mountain View, both about 1.5 miles away from home. 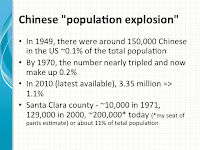 Another way of looking at the Chinese American influence in Silicon Valley is to trace the formation of professional Chinese American organizations here. The San Francisco chapter of the Chinese Institute of Engineers has been around for almost 100 years. My friend, the late Lester Lee, was a member, but I was not too familiar with this organization and their activities until today. AAMA was established in 1980 by a bunch of technical types that gathered in the cafeteria of Lester Lee’s then company. The feeling that Asian Americans in the valley needed a mutual support network was the motivation to start AAMA. I joined around 1983 and chaired a series of annual conferences on cross border strategic alliances starting in 1990 and became the chairman of the organization around 1996. AAMA started out as Asian American Manufacturers’ Association. Somewhere along the way, the name was switched to Asian American Multi-technology Association because we don’t manufacture anything anymore but there was value in keeping the AAMA brand. Ten years after AAMA, Monte Jade Science and Technology Association was established. It was the idea of Zhuang Yi-der who was then head of Taiwan’s Science Division based in Silicon Valley. To this day, Monte Jade has the support of the Science Division. The formation was a reflection of increasing presence of high tech companies from Taiwan in Silicon Valley and increasing presence of ex-pats here from Taiwan. At the beginning and for a long time, the lingua franca at the dinner meetings was Putonghua. At AAMA meetings English was always the spoken language. Shortly after Monte Jade, Chinese American Semiconductor Professional Association was established. 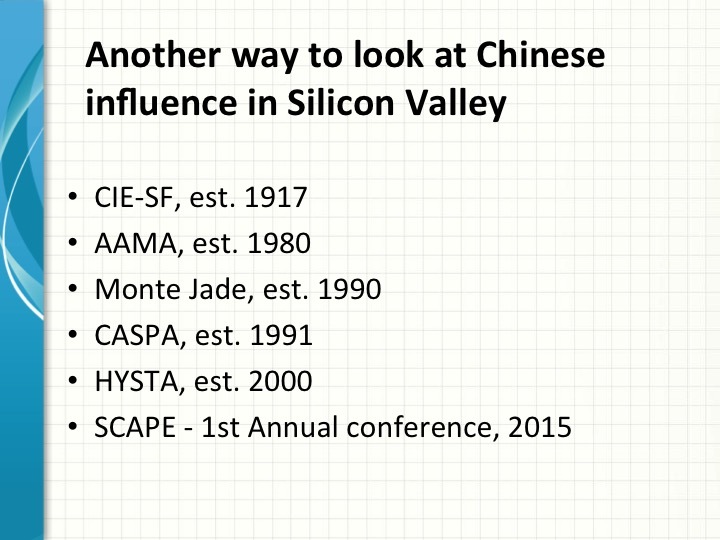 Again this was a reflection of the dominating presence of Chinese engineers in the semiconductor industry both here in Silicon Valley and in Taiwan. In fact some years later, Professor Annalee Saxenian of Berkley who studied the impact of immigrants on Silicon Valley made the observation that in Silicon Valley, IC stood for Indians and Chinese. Without these two groups of immigrants, the valley would implode. The most famous deal still talked about was struck between Jack Ma of Alibaba and Jerry Yang of Yahoo at a golf outing sponsored by HYSTA. At the time, Yahoo was the big brother and Alibaba the young upstart. Last year I spoke at the first annual conference of The Society of Chinese Physician Entrepreneurs. The founder of SCAPE is a practicing physician affiliated with Stanford and the organization was founded in 2014. 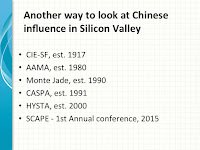 I mentioned SCAPE just as the latest organization to be established in Silicon Valley that I am aware of and is an indicator of how much we Chinese like forming affiliations and associations, sort of professional 同乡会. Now I would like to tell you about some of the Chinese American pioneers that broke through the glass ceiling in Silicon Valley. The earliest was David S. Lee (李信麟). In the late 60’s he started a printer company called Diablo Systems that was acquired by Xerox. As soon as his company was acquired, Xerox replaced him with a white guy because who have ever heard of a Chinese knowing how to manage. So David left and started another printer company called Qume Systems. This was before ink jet or laser printers and David invented a daisy wheel printer. 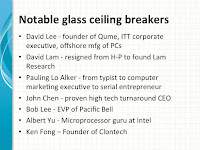 Qume was acquired by ITT Corporation and this time, David was asked to stay and run the computer peripherals division. When IBM rolled out the PC, ITT asked David to lead the effort to compete with IBM. To gain a competitive advantage, David took the PC designed by ITT to Taiwan and asked Acer and Mitac to make the PC as OEM supplier. That’s how those companies got into the PC business, and David came to be known as the father of Taiwan’s PC industry. Since then David has gone on to start and run other companies, served on the board of many companies and on advisory boards of venture capital companies. He also took time to serve as chairman of CIE, AAMA and Monte Jade. Very early on, after his reputation as a business leader was firmly established, he recognized the importance of being part of the American political process. He along with Lester Lee and Stanley Wang, founder of Pantronix--one of your gold sponsors, would fund raise for political candidates. They would actively encourage and support Asian candidates regardless of party affiliation. Many others in Silicon Valley have since followed their example. Because of his prominence and activism, he was appointed to serve on the board of regent of the UC university system for 12 years and he served on many presidential panels and commissions, appointed by both Republican and Democratic presidents. 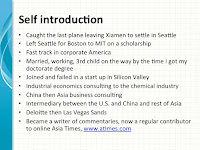 After his PhD from MIT, David K. Lam landed in H-P in Silicon Valley. One day he noticed that all of the sudden, a white guy that used to report to him was made the manager over him. David Lam resigned and started Lam Research in 1980 and he became the first Chinese American to take his company public in 1984. Those of you in CASPA would know that Lam Research is one of the major semiconductor manufacturing equipment companies in the world. Similar to David Lee, this David has gone on to start other ventures, advise still more others and sit on board of some. He also has sat in presidential and state level commissions. In the early 90’s, his leadership established AAMA as the preeminent Asian American professional organization in Silicon Valley. One of his smartest moves, David convinced Pauline Lo Alker to assume the leadership of AAMA after him, which she did for the next four years from 1991-94. Pauline was charismatic and a high-energy person. You would find it hard to say no to her. She got people energized and engaged in AAMA and she began an active mentoring program for the young professionals. Under her leadership, AAMA became known as the meeting place for valuable networking and relationship building. Pauline began her career facing two handicaps. She was Asian and female. Even though she was trained in computer programming, her first job was as a typist in the computer department of GE. Once given the opportunity to show her ability, she moved up quickly and landed a job in Silicon Valley. From technical positions she moved into sales and marketing and became the vice president for a workstation company called Convergent Technologies, a rising hot company in its days. She then started a workstation company called Counterpoint, which was acquired by Acer, the Taiwan PC company. By the time she was leading AAMA, venture investors had recruited her to turn around the fortunes of Network Peripherals. She did that and took the company public. At various times, Pauline has received national recognition as one of the most influential woman executive and role model for aspiring women in the high tech industry. The above three individuals achieve their success as hugely capable entrepreneurs. 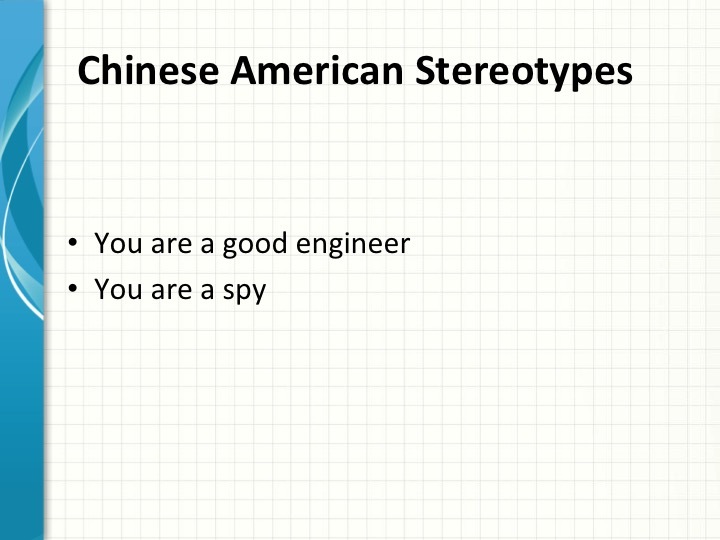 Because of their accomplishments, Asian Americans are no longer perceived as just good engineers. Because of their prominent success stories, the venture capitalists on Sand Hill Road no longer ignore Asians with business plans. These firms even began to hire partners with Asian faces. I cannot begin to tell you how different Silicon Valley was before and after these pioneers made their mark. I honestly believe their record pave the way for all the others to follow. John Chen was different. More than a decade younger, he was not an entrepreneur per se. Instead he showed that he knows how to manage and run companies and can turn sick companies into healthy ones. When he was asked to take over Sybase in 1997, he already had a proven track record in senior management positions. Sybase was literally on a financial death spiral when he took over. He changed the company business focus, returned the company to profitability and sold the company to SAP for almost $6 billion thirteen years later. He is now trying to do the same with Blackberry. John sits on two major corporate boards, Disney and Wells Fargo as well a bunch of high tech start-ups and as trustee of a number of national NGOs. He also led the fund raising drive to build the library in honor of Chancellor Tien Chang-lin at UC Berkeley. Bob Lee basically climbed the corporate ladder within one company becoming the Executive Vice President of Pacific Bell. He retired after a 26-year career with the telecom company. In his day, if you go by size of the company, he was the highest ranking corporate executive of Chinese ancestry in the San Francisco Bay Area. He was chairman of the board of Blue Shield of California, served on the board of numerous smaller companies and non-profit groups. In particular he was active on the board of Asian Pacific Fund and Youth Tennis. Both Bob and John Chen had served as past chairman of The Committee of 100, a national organization of prominent Chinese Americans. Like Bob, Albert Yu is also a lifer who spent virtually his entire career in one company. In this case it was Intel. The difference is that during his stint there, Intel grew from virtually a start-up to the leading semiconductor company in the word. Albert led Intel’s effort in microprocessor development, the dominance of Intel’s microprocessor in the PC industry was the reason for Intel’s success. He clearly played a major role in Intel's rise. After 30 years, Albert retired from Intel as their senior vice president. He wrote two books on management Intel style along with many technical papers. After retirement, he continued to advise companies and sat on the boards of some of the companies in the valley. His passion was mentoring Asian Americans. He organized mentoring sessions inside Intel and after his retirement he was active participant of mentoring programs organized by Monte Jade and others. 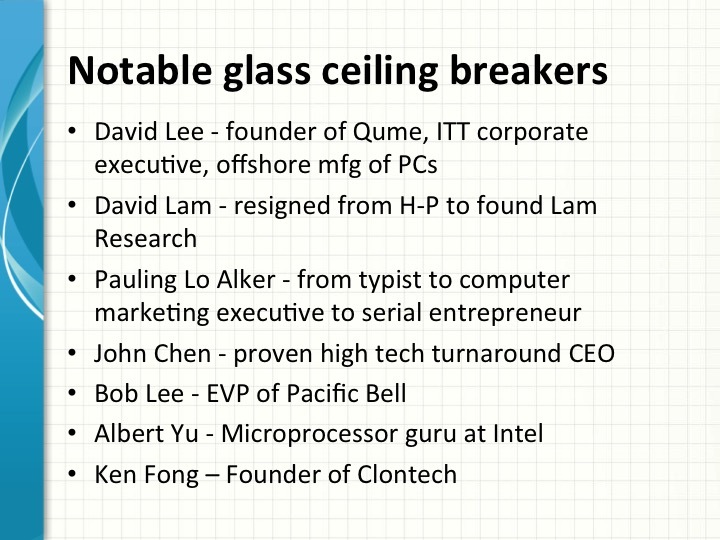 I save Ken Fong for last on this list because he started a company in biotech when electronics and semiconductors dominated the valley. Secondly, like John Chen, Ken is not retired but actively working. He sold his company to Becton Dickinson for undisclosed hundreds of millions and he has been busy investing and coaching young biotech startups, both here in the US and in China. Ken has been very generous with his wealth--not only writing checks for charitable causes, but he actively supports Asian American candidates running for political office. Because of Ken being politically active, he was appointed to the board of trustees of the California State Universities. He was the second Chinese American to serve in this capacity. The first was Stanley Wang of Pantronics. Ken and I are part of a team organizing a public forum co-sponsored by the Commonwealth Club where we present topics and speakers different from the usual American mainstream. The topics involve sensitive areas on US China relations that we believe important for the American public to know more about. We have invited speakers from China and U.K. in this endeavor and Ken has generously underwritten the expenses in bringing the speakers over. I have selected for discussion today the glass ceiling breakers that I knew personally and are friends of mine. I don’t claim this list to be all inclusive. I am sure there are others worthy of mention. My point is that by breaking the glass ceiling, they made it easier for the many that have followed their footsteps. It should be obvious from the success stories I just told you that there is no single route to getting there. What they do have in common, however, is that they all gave back to their community in one way or the other. 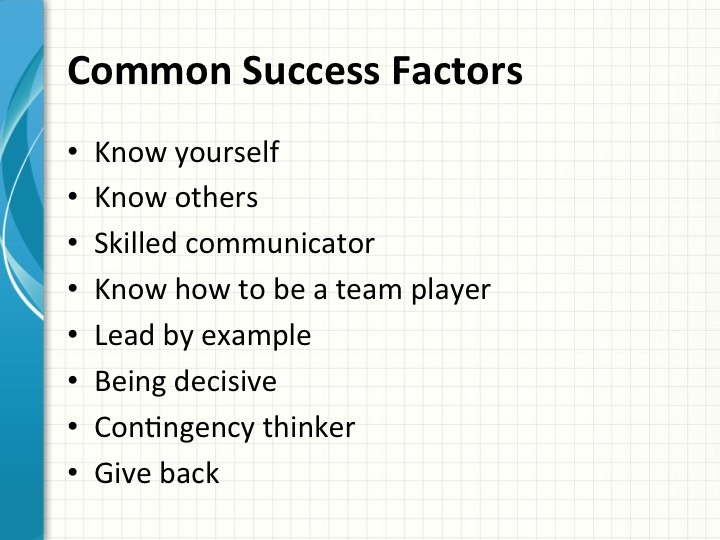 Now, I would like to share with you what I think are essential attributes necessary to succeed. If you think about it, these are really quite self evident, so I am going to go over them quickly and we can always discuss any of them in depth during the panel discussion. But first, what do we mean by success? It’s not the same for everybody. Some want to be famous. Others want to be rich or powerful or both. Still others want to be comfortable in his/her own skin. Each of you has to decide for yourself. Know yourself. What I mean is that each one of you needs to take a realistic look at yourself and have the ability to objectively identify your strengths and your weaknesses. Know others to me means that you have solid interpersonal skills, you know how to establish rapport and empathy with others. You also know how to size up others and decide if their skills complement yours. Both attributes are, in my view, important if you decide to start a new venture and need to build a team. You can’t find a team with complementary skills if you don’t know what skills you have and don’t know how to identify needed skills in others. In America, everyone is selling him or herself all the time. You are constantly being evaluated on who you say you are. If you choose to be humble typical of a reticent Chinese; that might be OK in China but here you are putting yourself on discount. Of course, you will need excellent presentation skills, verbally and also in writing. Whether you are joining a young startup or a giant corporation, you need to know how to be a team player. Sometimes you are a member of the team and other times you might be leading the team. Either way, you need to help the team move together. This means no back stabbing, no forming factions, no acts of a lone ranger. I might add that one of the best places to practice team building is to volunteer, such as one of these sponsoring organizations. Why? Because when everybody is a volunteer, there is no command structure, as you would have in a company. To get anything done and move together as a team, you have to have good persuasive skills. To be a good leader, you must be willing to lead the charge up the hill and not sit in the back and order everybody else to face the enemy fire. A good leader also knows how to be decisive and know when a decision has to be made and move on. Sometimes the timing is such that you are required to make decisions sooner than you’d like, but you have to have the will and confidence to make the tough calls. One attribute that will help you being a decisive leader is the ability to think of contingencies. In other words, for every critical decision, you will have thought of alternative scenarios and what-ifs. In this way, if you make a wrong call, you will be in a position to know how to rectify the situation. Last but not least, I believe it’s important to give back for several reasons. For one, you will feel better about yourself and that will show when you interact with others. For another, others have helped you on your climb to the top and you have a moral obligation to do the same. This is my last slide and I have two thoughts to leave with you. Contrary to common wisdom, America is not a level playing field. Yes, America is the land of opportunity for anyone willing to work hard, but it does not mean that you will be treated the same way as the person next to you. If you are Asian, if you don’t speak accent free English and if you not the assertive type, you can expect to put out 110% or even 120% of effort in order to get the same recognition and respect as the white person. This is just the way it is. If you should be fortunate and work in a place where your race, accent and manner is not held against you, so much the better, but at least you should be prepared and ready to accept the bias as an added challenge. Silicon Valley is more likely to be equitable than elsewhere in the United States. If you ever relocate to other parts of the country, you should be prepared to over come hidden and unconscious bias. 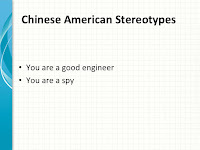 An even more insidious form of racial bias that you must be aware of is the U.S federal government considers each and every one of you a potential spy for China just and only because you are Chinese. I am part of the task force in the Committee of 100 that goes around the country giving half-day workshops on how to avoid being a victim of racial profiling. We don’t have time to go into this today. For the purpose of today’s discussion, let me simply give you some practical advice. If you work in high tech or in government labs or even in academia, you should assume that someone is reading your email and listening in on your telephone conversation, and I don’t mean hackers from PRC. The initials I am thinking of are FBI, CIA or NSA or ATF or DEA. I just heard on the public radio that since 9-11, we now have over 40 government agencies that are running undercover investigations. Not all of them are concentrating on Chinese espionage—thank goodness--but a sobering thought nonetheless. You don’t want do anything that can be misinterpreted as something unsavory. Just keep in mind that our law enforcement agencies are quick to jump to conclusion and in cases where national security is involved, you are presumed guilty and it’s up to you to prove that you are innocent. If the FBI breaks down your door and want to question you, just remember that you have the right to remain silent and to legal counsel. Don’t make the naïve mistake of thinking that if you cooperate, you can extricate yourself and convince them that they have made a mistake. When they come to see you, they are already convinced that you are guilty of something. Your agreeing to talk to them will simply give them additional opportunity to find flaws in what you said and accuse you of perjury and other charges. The only protection for you is for you to have your lawyer with you. With that cheerful note, I am finished with my presentation and look forward to a vigorous panel discussion.